This postcard showed up on PostSecret. I still live with this kind of shame, so it screamed to me. My donuts of choice were Hostess Raspberry-Filled Powdered Donuts. They don’t come in dozens, but if you’re lucky, you can get the “two free” donut box and get eight. I could eat all eight without feeling sick unless you count the shame. Thinking about it now, I still feel ashamed even though I haven’t eaten a whole box for years. I found a two-pack of those donuts at the convenience store last month. I ate one and shared the other with Mike. The terrible irony is that they don’t taste all that good. They were sweet, but more importantly, they were always easily accessible. Whenever I had a bad day, I could stop at the gas station, pick up a 32 ounce Diet Coke and a box. Those donuts helped me through a lot of stress and I wore them on my body for a long time. 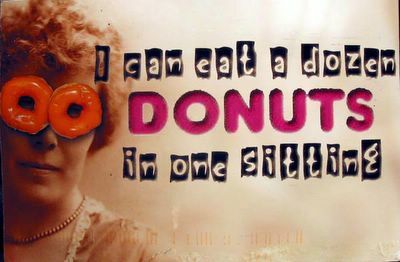 It wasn’t until I learned to deal with my stress without turning to the donuts that they finally left my hips, stomach, back, arms, legs and face. Man, that was a hard journey and seeing that postcard made me realize that I’m still ashamed that I had to travel that far.